Imagine yourself leaning back, feet propped up, sipping on a delicious cocktail while watching a beautiful, colorful sunset over the glistening ocean. Grooving tunes fill the air, you deeply breathe in the fresh smell of the ocean and find yourself melting further into your comfortable daybed. You feel like you could stay there forever. Sounds nice doesn’t it? It’s one of my happy places and it’s exactly how I feel when we visit our favorite venues in blissful Bali. 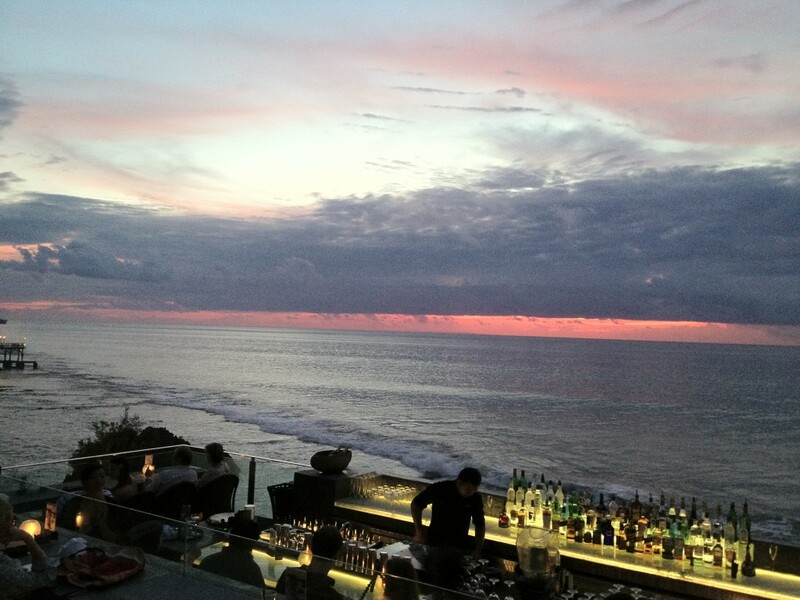 There are many things I enjoy about Bali but the one that tops the list is to relax and watch the beautiful sunset while enjoying a fabulous cocktail at a prime location. As you can imagine there are many types of places you can do this but I have three favorites I wanted to share with you. If you’re Bali-bound in the future definitely add these venues to your list and I promise that you won’t be disappointed! Ku De Ta. This is a prime spot to chill out and watch the sunset while enjoying yummy cocktails and scrumptious nibbles. Ku De Ta has been around for awhile and there are some that think it’s no longer the “it” place to go in the trendy Seminyak area. However if your priority isn’t where to find all the trendy folks and you’re looking for a relaxed, beach front venue with fun cocktails, this is it. Ozdane and I love it. We make a point of hitting up Ku De Ta one night every time we visit Seminyak. It’s situated beachfront with big daybeds, tables and benches right in the front so you get a prime spot to watch the sunset. It is all outdoors but has a great swanky, lounge feel to it and you can’t help but completely relax when you’re there. Ku De Ta in Seminyak, Bali. Ku De Ta has a fabulous cocktail list. 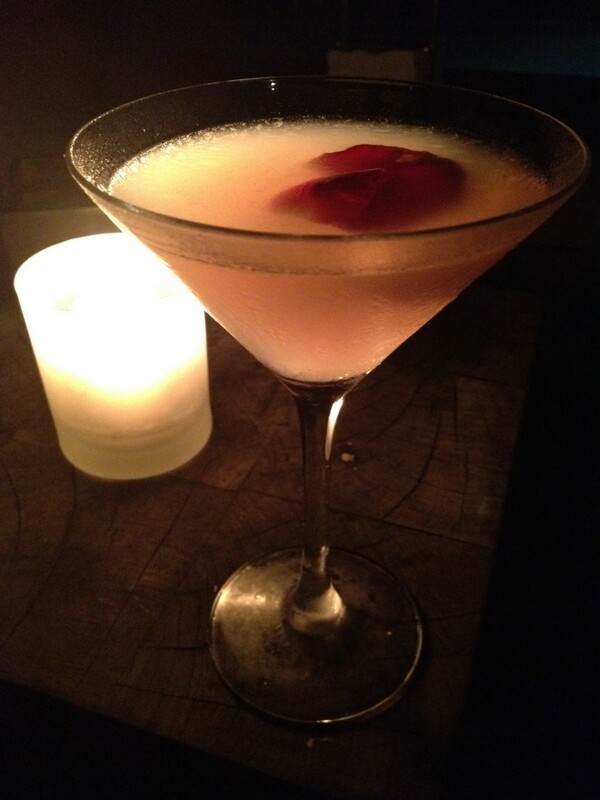 My personal favorites include the lychee and rose martini, KDT mojito and the raspberry and cucumber martini! YUM! It doesn’t stop at the cocktails and mocktails either. The food is just as good with a variety of nibbles and pizzas to choose from on the menu. Some of our favorites include the lobster and pork gyoza (wow) and the Indonesian chicken and prawn spring rolls. BUT our absolute favorite you must try is the crispy chicken karage with wasabi mayonnaise! It is to die for! My tummy is rumbling just thinking about it! There is also a restaurant if you feel like sitting down for something a bit more formal. If you’re in Seminyak, Bali definitely add Ku De Ta to your list of places to go. Potato Head Beach Club. Ozdane and I finally hit up this wonderful venue during our most recent trip to Bali this month. Like Ku De Ta it is situated beachfront for perfect sunset viewing. It also is located in popular Seminyak so it’s easy to find if you’re staying in the area. Similar to Ku De Ta, Potato Head Beach Club has daybeds, tables, lounge chairs and more to choose from to ensure you’re totally relaxed during your visit. They also have a restaurant which is more formal than the casual, outside seating. Potato Head also has a large infinity pool situated between the daybeds and the beach so if you feel like taking a dip while there it couldn’t be more convenient. There also is a big grass area for an even more relaxed option. The vibe and music is similar to Ku De Ta as is the cocktail selection. The food is a bit more gourmet with less of a small plates selection and more mains. We went for the burgers and they were amazing! 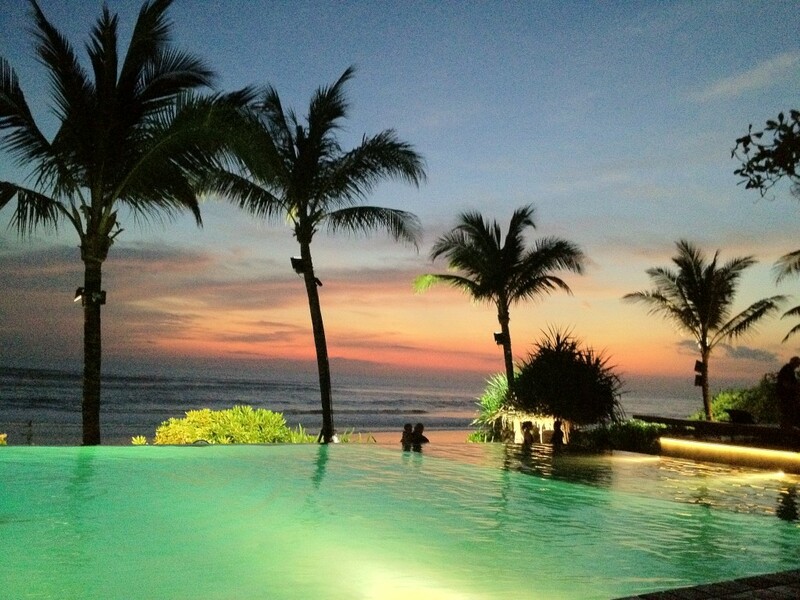 Sunset and infinity pool at Potato Head Beach Club in Seminyak, Bali. Rock Bar Bali at Ayana Resort. This is by far one of the best and most memorable bar experiences I’ve ever had. Yes I know that’s a huge statement but it’s true. 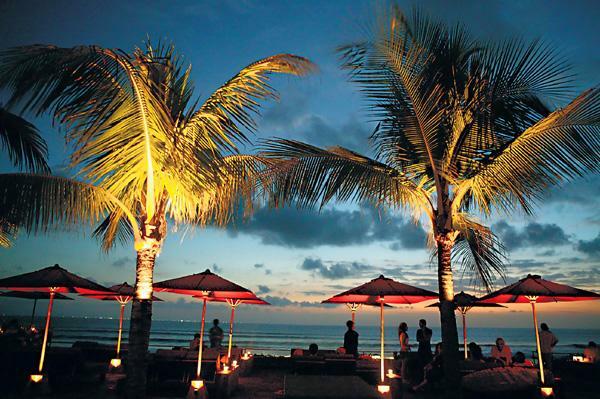 Rock Bar Bali is located on the amazing Ayana Resort property south of Seminyak in beautiful Jimbaran Bay. The Ayana Resort itself is absolutely gorgeous. That will be another blog post. I had read and heard so many great things about Rock Bar so we knew we just had to check it out this trip. Can I just say, WOW!! Rock Bar is built into the side of a cliff over the ocean. It’s truly one of the most breath-taking settings I’ve ever seen. Whoever thought of this idea is a total genius in my book. Upon arrival you get in line…to take an inclinator (open-air elevator) down the cliff side to the bar. How many bars have you been to where you took a cliff side inclinator to get to?! I’m guessing zero to two tops. There is an upper level where you get the prime views and a lower level where you still enjoy very nice views. I mean you’re at a cliff side bar over the ocean, who’s going to complain? Like the other two venues they have a variety of cocktails and also a good assortment of nibbles so you can just stay there the whole night without rushing off to a dinner reservation. You don’t have to be staying at the Ayana Resort to enjoy Rock Bar either. However if you are a resort guest you will get priority entry and most likely a prime spot at the bar. If you’re in Jimbaran Bay, Rock Bar is a MUST! Don’t miss it! 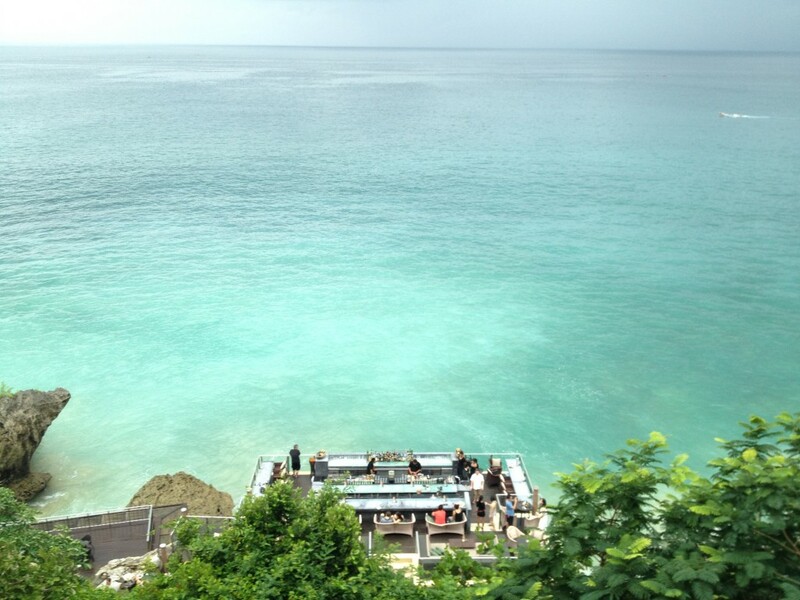 Rock Bar Bali at Ayana Resort from above. What are your favorite sunset cocktail spots in Bali? I’d love to hear about more so please share! Nice article and beautiful photo. I am Malaysian but do not have chance been Bali but most of my friend thumb up if mentioned Bali. Anyway, can I share your photo which title “Just WOW at Rock Bar Bali, Jimbaran Bay Bali” in my fan page https://www.facebook.com/vkentravel and my website? I will put your link as well. Hi Ken. Glad you enjoyed the post and thanks for your comment. Sure please feel free to share my Rock Bar Bali photo on your page. That would be great if you can include my link also. Definitely visit Bali when you have a chance! It’s a wonderful spot!